Government proposals to ban the use of red diesel to power fridge units on vehicles will add at least £100 million to the operating costs of food distributors, the Food Storage and Distribution Federation has warned. The government has floated the idea as part of its Clean Air Strategy. But the FSDF argues that the change would increase food prices and a slow investment in innovative technologies. Chief executive Shane Brennan has written to environment secretary Michael Gove setting out the misunderstandings propagated about how many diesel-powered fridge units are used on vehicles on UK roads and the contribution they make to air pollution. The Federation shares its estimate that the removal of the rebate would add at least £100 million a year to the operating costs of food distributors. Red diesel is taxed at a rate of 11.14p per litre, compared to the standard rate of 57.95p per litre. 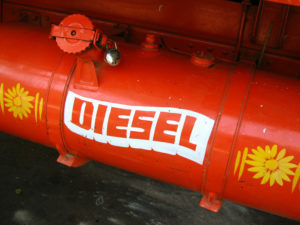 It accounts for about 15 per cent of all diesel consumption in the UK. Brennan said: “We are fully committed to our responsibilities to find ways to reduce emissions and to playing our part in meeting the ambitions of the Clean Air Strategy. We understand why Government is considering removing the red diesel rebate for equipment like refrigerated units on delivery vehicles, but we urge Ministers not to do it.